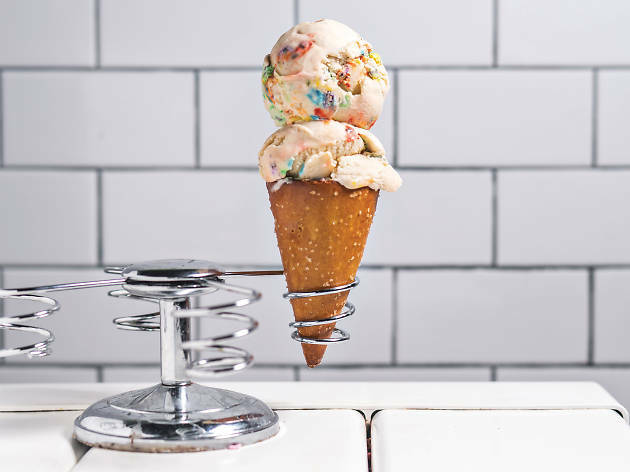 This behemoth two-story follow-up to husband-and-wife team Brian Smith and Jackie Cuscuna’s Prospect Heights scoop shop comes complete with bright barn-animal murals, aqua vinyl booths and a 25-seat roof deck. All that extra room means even more ice cream. 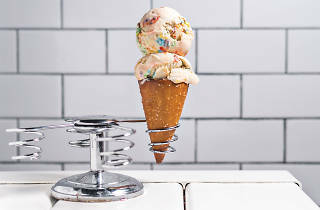 The 1,000-square-foot kitchen churns out 24 ever-changing, off-the-wall flavors —up from the original store’s 16—that will please inner and actual kids alike. Snap Mallow Pop, an überrich, jet-puffed marshmallow number studded with crunchy, toasted rice-cereal nubs, is as comforting as a bake-sale Rice Krispies treat, and the Munchies jazzes up pretzel-infused ice cream with clusters of potato chips, Ritz crackers and mini M&Ms. Do you like ice cream? Then you must go here. That's really all there is to it! They also have a rooftop patio perfect for a summer night scoop! Cute ice cream spot spot in Brooklyn! The choice of flavors is incredible! Every flavor looks amazing and I want to try them all. The staff is nice about sampling flavors, so be sure to take advantage! There are also several vegan and non-dairy options. However, the ice cream is a little pricey, but totally worth it. Somehow I always end up sticking with my favorite, chocolate fudge sorbet! I cannot say enough good things about this place! Despite freezing temperatures, I made the trek here and enjoyed a cone of "It Came From Gowanus", a dark chocolate based ice cream with hazelnuts. Will definitely be back here again soon. This is LITERALLY the best ice cream in New York. 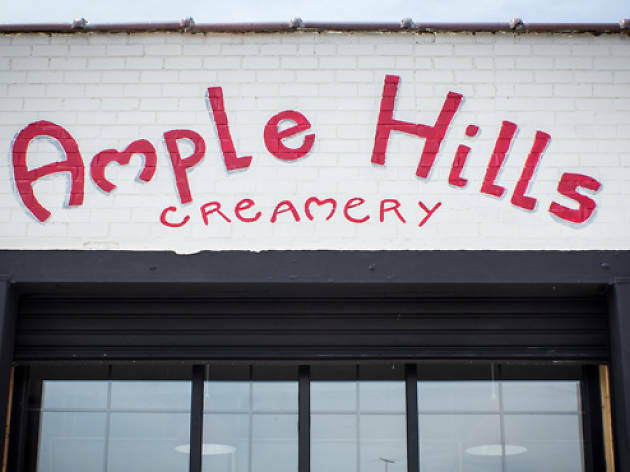 Incredible flavors (and hilarious) and the staff are SO PATIENT and let you try all of them. YUMMM I'm hooked. I mean, can you really go wrong with ice cream, made on site, on a rooftop? Answer: no. Throw in the fact that it's about a 15 minute walk from Prospect Park and two avenues from Park Slope and you're set. It's open late too. I don't love all of the flavors (salted crack caramel is a popular choice and I was not a fan), but Snap, Mallow, Pop and It Came From the Gowanus are addicting. Just make sure to take your winnings upstairs to sit with plenty of Park Slope babies and yuppie parents, but you won't even notice. Ample Hills has the best ice cream in NYC - plain and simple. Must-try flavors are the Ooey Gooey Butter Cake, The Munchies, and Nonna D's Oatmeal Lace. The Salted Crack Caramel sounds good, but doesn't have enough sweet to balance out the salty. The locations are not easy to get to, but ultimately the ice cream is worth the trip. 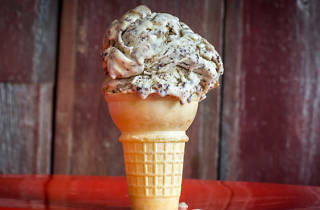 The Gowanus location has plenty of space to enjoy your scoop, while the Gotham West location is best for Manhattanites. But be careful - you'll need to be ready to eat your ice cream while on the move. This location is a bit off the beaten path for me, compared to the one near Prospect Park, but I’m sure Gowanus residents are very pleased. 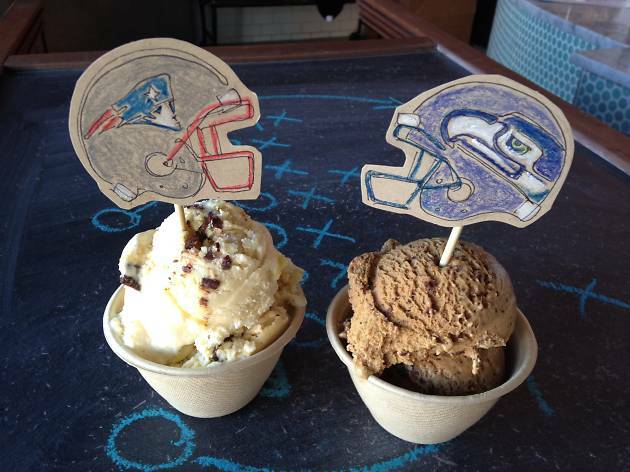 Ample Hills Creamery has the kind of ice cream that you want to eat even when it's freezing outside. It's all totally house-made and they come out with new flavors all the time. The last time I went to this location, I ordered my favorite, the spicy Mexican hot chocolate, and went to sit on the roof, which you should definitely do if it's warm enough outside. 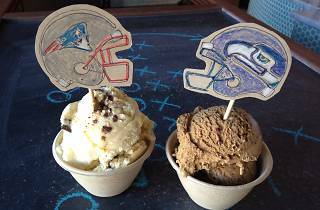 The space has great views of the street, and you can lounge in Adirondack chairs as you eat your ice cream. Ample Hills doesn't disappoint. The portions are huge, the price reasonable and the flavors deliciously original. Ooey Gooey Butter and Peppermint Pattie are my favorites. They both taste exactly like what their names lead you to expect. 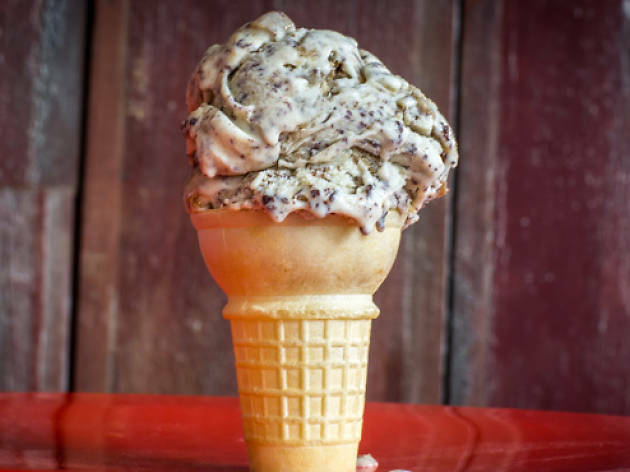 Ample Hills is one of my favorite ice cream spots in all of Brooklyn and Manhattan! 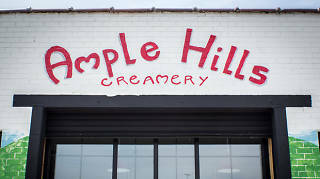 The flavors are amazing and unique but be prepared for some variance between trips, as they make their ice cream on site (or so I assume from the massive kitchens you can see in their locations). They keep it simple in the sense that all the flavors are good old fashioned sugary-sweet like the ice cream that you had as a kid, but in combinations that you probably wanted as a kid but could never get. Think rice crispy treat ice cream. My personal favorite is butterscotch pudding but I never make a decision without sampling a few!